I can see a 1 minute trailer at Sony's, but gameplay? Nah, it's never going to happen. It's far from being a R* thing and they don't need to change their ways. Newswire is their electronic E3. They won't show a gameplay without the traditional narration (Gameplay series). This. It's funny that people here never learn from those things. I mean, take GTA V as an example or even Max Payne 3. After the Hot Coffee scandal they pretty much rarely show up on E3. The last time I've seen was the GTA IV announcement and rockstar's partnership with Sony (PS4/GTA V bundle). Apart from this, they do not show up. At least not regarding their big titles. A "Gameplay" trailer is often times a misused term gamers and people in the industry use as an example of a trailer showcasing actual in-game gameplay with in-engine cutscenes cut together to explain a narrative for your game. 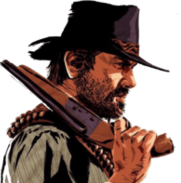 For example of course the GTAV PS4 announcement and even RDR2s trailer. In that sense Rockstar cutting a "gameplay" trailer for Sony to show at E3 is always a ever possibility since they've done it before. Rockstar are mixed on E3 and big show demonstrations. Dan Houser went on record that demonstrating your game at E3 can be detrimental to the team and question of you're going the right direction as evidenced by GTAIIIs reception at E3 2001, and also the big stage just isn't ideal. On the other hand we have leaked emails and documents where Rockstar were prepared to take and show L.A Noire at E3..2010 maybe?...but because of the state of the game and missing deadlines they canceled these plans at the last minute. So basically it can go either way but if 1 of the big hardware guys has some kind of exclusivity deal then I would expect a trailer. In this case don't be surprised if a new RDR2 trailer is shown at Sony's conference with an PS4 Pro bundle announcement since they have a exclusivity and marketing deal. I think a lot of it these days is that just don't need E3 all that much. They've shown with MP3 and RDR1 that they will go to shows to show off new games, or ones from revived franchises. But with GTA? They actually build more hype by doing it on their own terms. The whole "Rockstar don't need E3" shtick that fans say is not only actually true but generates hype because of it. They're at a stage that every developer would kill to be at. Only Blizzard, Valve and probably Naughty Dog can do the same. Them being mysterious, secretive and bullish is part of their PR, and they do it better than any other developer out there. rockstar new york is hiring a data scientist. "provide consumer-ready analysis"
Rockstar are always hiring for all their studios. Also, NYC is their HQ, and as far as I know it's not a development studio (although they do handle at least some of the animation/mo-cap I believe). They are the ones who handle the financial side, publishing, online presence, PR, and also create many/all of the trailers they put out - to put it simply. I was thinking today how there has been very little "information" surrounding this game being found online. Back during pre-V, we had those domain registrations being found, casting calls for Project Rush, the resumés of voice actors and motion capture artists... I'm sure there were some Max Payne casting calls found around the time too. For RDR2, there has been pretty much nothing. All quiet on the western front. Obviously the "leaked map" is a big question mark but that's been talked about to death, so I'm referring to other kinds of "information". They must have really had a crack down on how this information gets out, or they have operated so covertly this time that it's just under our eyes and goes unnoticed. I was having a search around (as you do ) and found this list of titles being developed by various game companies that got outed by SAG-AFTRA, the union that represents voice actors, during a strike last November. There's a couple listed there by Take-Two, projects Dust and Lazarus, and I found another reference elsewhere to a project Alligator. Obviously this might not be anything related to Rockstar, but thought it was interesting as this is the first time I've seen it, and it got me curious about what RDR2's codename could be since internally they use "RDR2" for the first Redemption. Just chewin' on nothing here lol. Yea there's really been nothing so far. GTA V had the whole 3 protags + Los Santos leaked a year before it was announced too. The only thing we've had is the GTA Online leaker a few months back saying it's 3 protags and it's John's old gang, but none of the playables are John. But he gave that away so... flippantly that despite his track record for GTA:O I'm a bit sceptical how much truth is in that. I remember reading about this strike when it was mentioned by a GTAF member who happen to occasionally visit the forums and post some interesting insights. I hope it doesn't affect the progress of the voice acting of RDR2 and somehow cause an unintentional delay. the quality control guy is not around anymore, yes I mean the benz, and since there's lots of things to be ironed out R* might be "stuck" at that stage, thus cannot focus on leaks/trailers etc. I didn't know The Benz has a GTAF account.